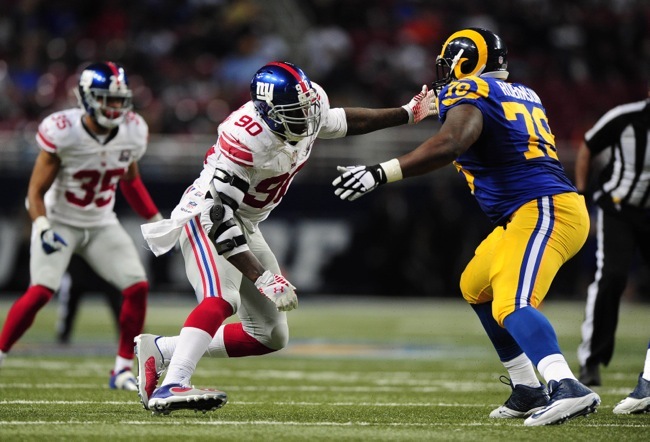 Report: Jason Pierre-Paul Expected to Skip Mini-Camp: According to multiple media reports, New York Giants defensive end Jason Pierre-Paul will likely not attend this week’s 3-day mandatory mini-camp that begins on Tuesday. Pierre-Paul was designated as the team’s Franchise Player in early March. Since he has not yet signed his 1-year, $14.813 million tender, Pierre-Paul cannot be fined by Giants for skipping the mini-camp. Pierre-Paul has not attended any of the Giants voluntary offseason program workouts (which began in April) and Organized Team Activity (OTA) sessions (which ended last week). He has been working out with his own personnel trainer in Miami. Without a contract, Pierre-Paul is unlikely to risk an injury during on-field practice sessions. The New York Daily News is reporting that even if Pierre-Paul decides to show up for mini-camp team meetings, he will not participate in practices because of the injury risk. July 15 is the deadline for all teams to sign their Franchise Players to long-term contracts. 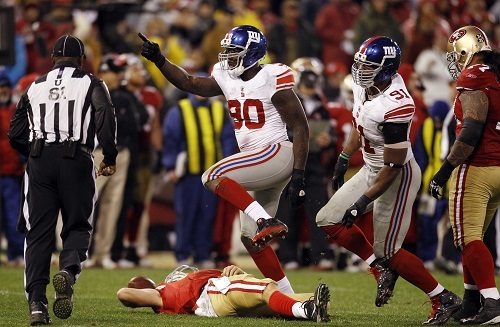 After this date, Pierre-Paul may only sign his one-year tender with the Giants and his contract cannot be extended until the 2015 season is over. The Daily News is reporting that no serious long-term contract negotiations have taken place between the Giants and Pierre-Paul and that Pierre-Paul will likely sign his $14.813 million tender before training camp begins in late July. The paper says the Giants “are leery of entering into a long-term deal” with Pierre-Paul due to concerns about previous back injury issues that affected him in 2012 and 2013. 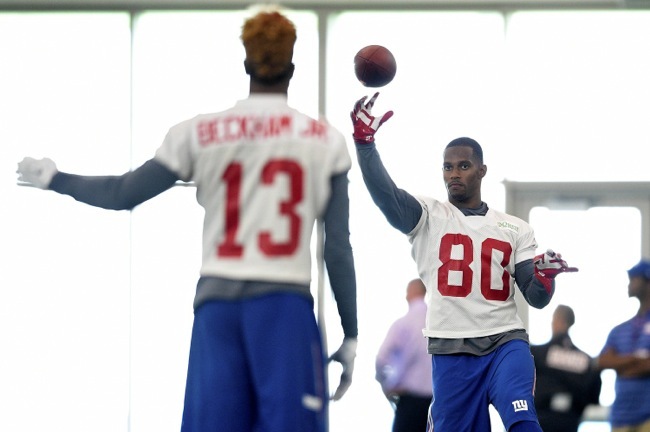 The New York Giants completed their seventh of ten Organized Team Activity (OTA) practices at the Quest Diagnostics Training Center on Monday. The final three OTA practices will be held this week on June 9 and June 11-12. The Giants will hold a mandatory, full-team mini-camp on June 16-18. Wide receiver Odell Beckham (hamstring), wide receiver Victor Cruz (recovering from knee surgery), wide receiver Marcus Harris (unknown), tight end Larry Donnell (Achilles tendinitis), offensive tackle Will Beatty (recovering from pectoral surgery), offensive guard Geoff Schwartz (recovering from ankle surgery), DE Robert Ayers (sprained ankle), defensive end Damontre Moore (recovering from shoulder surgery), defensive end Owamagbe Odighizuwa (leg), linebacker Jonathan Casillas (injection), linebacker Jameel McClain (back), and safety Nat Berhe (calf) did not practice or fully practice. “Some days are good and some aren’t,” said Schwartz of why he did not participate in team drills on Monday. 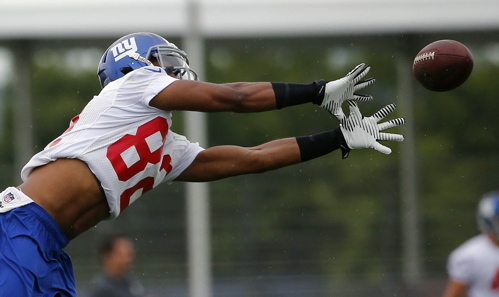 Rueben Randle, Preston Parker, and Corey Washington saw first-team reps at wide receiver. Washington had another good practice. Ereck Flowers continues to see reps with first- and second-teams at left tackle. John Jerry started at right guard. On first-team defensive line, Cullen Jenkins continues to work at right defensive end with George Selvie at left defensive end. Johnathan Hankins and Markus Kuhn were the first-team defensive tackles. Kerry Wynn also received some first-team defensive end reps and had a good practice. 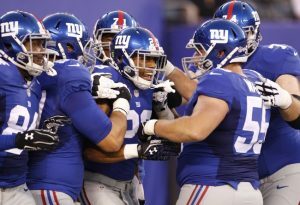 In nickel defense, Jon Beason and Devon Kennard were the linebackers with Trumaine McBride the slot corner and Cooper Taylor and Landon Collins the safeties. 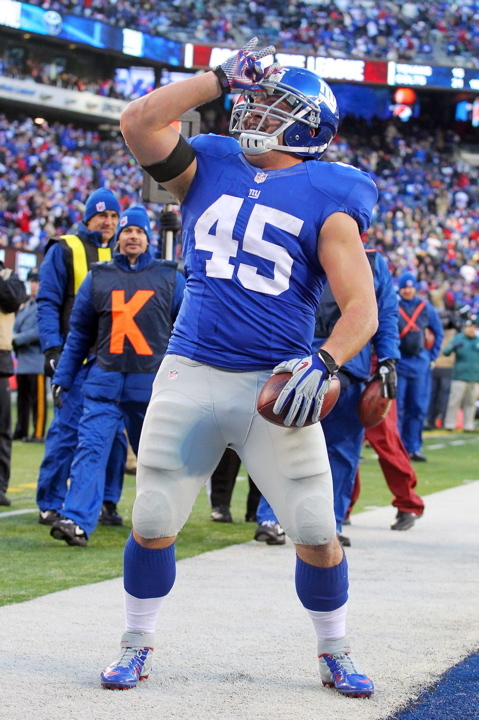 Mark Herzlich also saw some first-team reps in lieu of Beason. Cole Farrand saw some first-team reps at linebacker along with Beason and Kennard. Cornerback Prince Amakamara picked off a pass from quarterback Ryan Nassib. 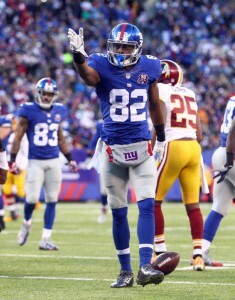 Tight end Jerome Cunningham continues to impress, including catching a 20-yard pass from Manning. Q: You have had a bunch of time with the rookies now… How are they integrating? A: Whenever you throw something new, it is the same as if, obviously it is the first time they have heard it. There are a bunch of installations. When you have an installation and a review, they do fine with that. Add something new and it is a little bit more difficult, so that is how you see it. They have hung in there and worked hard and they are obviously making progress. They have to. Q: Is it hard for guys like Landon Collins and Ereck Flowers when you throw them in there with the first team? Does it make it harder for them because they are trying to catch up to the veterans? A: I don’t think so. I think, if anything, if you put yourself in that situation, that really makes it interesting. Holy cow, here I am. They have to earn those spots. They have the opportunity right now. Q: What can you tell about offensive line play in general without pads? A: It is not easy. You look at every tape and try to be as technical as you can, but there are obvious restrictions for both defense and offense without the pads. 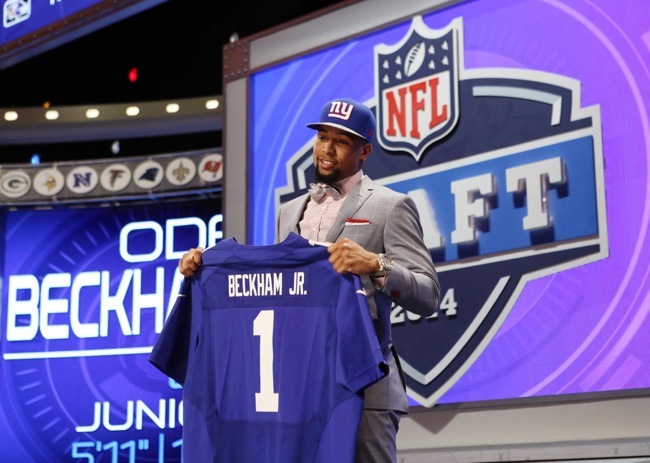 Q: How is Odell Beckham Jr. doing? A: Seem to be better. Seems to be a little bit better today. They did more with him. Q: Did he do anything last week? A: He did some individual stuff, but that was it. Q: Is he going to be okay for next week? A: I don’t know. I only know what they tell me. They probably won’t be able to project that until we see this week. Q: Do you still expect Jason Pierre-Paul next week? Q: Have you noticed if Prince Amukamara is out there trying to play at a faster speed? A: I thought he was playing at a nice speed last year, too, when he was injured, so I think he is just trying to pick up from there. It started out as it normally does. He was under control. He has been enticing people to try to throw it over his head because he has broken on the underneath stuff very well. Q: How does Kerry Wynn look to you? A: Kerry Wynn works hard and makes plays. He is very consistent. A: We have been standing here. This would have been the ideal time for him. Unfortunately, he has not been able to get to where he can really drive, so it has been very slow. 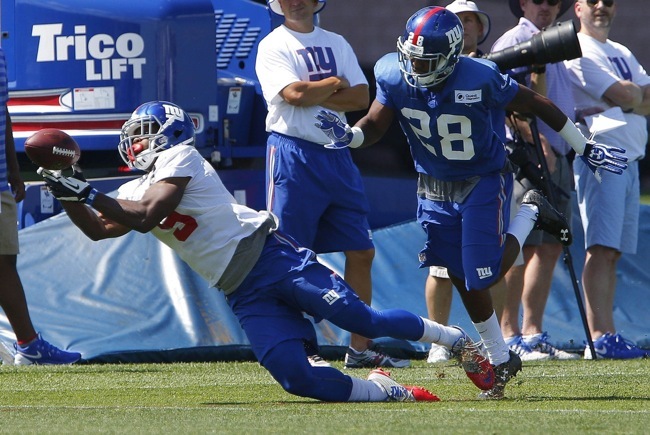 Q: That helps Cooper Taylor and Landon Collins get reps? A: It helps them, but it doesn’t help Berhe any, and he was here as a rookie and got to play a little bit. He also did a nice job on special teams. He has a lot of things of that nature, but this would have been ideal for him. Crying over spilled milk there. Q: Do you ever leave an OTA day in June like this thinking big picture? A: That is the problem with being a coach. The good things pop up and then you quickly talk about the things that weren’t so good, so you kind of get back to the balancing it off. You like to see something go well and be enhanced and when it does, you are glad about that, but then you are thinking ‘we do have to stop the run’ or something like that. You start to look at a little bit more scope, but really on a daily basis, practice to practice, as I just told everybody – coaches this morning and players this afternoon — what they should be doing right now is deciding how do they want to finish the spring and what are their goals and what impression do they want to have? What have we accomplished when we finish up the mini-camp? Hopefully that is where they all are. Q: When you gathered them before today’s session it seemed like they had a spirited response… Did you say something in particular? A: I just said we need to have four solid practices and a good mini-camp to wrap the spring up. Q: You have seen the flashes from Corey Washington in the past. Have you seen more from him this spring? A: Yeah, he has had a nice spring. He has worked hard. He has had a good attitude. He has had a smile on his face. He has done most everything we have asked him to do. I think every time he has been called upon he seems to have responded. Q: Can you assess where Washington has come growth-wise on special teams? A: Not on special teams yet, but I think the opportunities he has had offensively, he has taken full advantage of his year to learn, and I think he has matured a little bit. He has had a solid spring. Q: We haven’t seen Damontre Moore or Owa Odighizuwa in the team drills. Is that them needing to catch up or something physical? A: They are being held back. We want to get Damontre in some, but we don’t want to do anything that is going to set him back. He may get a little bit more work than he is getting, but not a lot. Owa is being held out. It is a leg. Q: Re: Jonathan Cassillas and Jameel McClain absence from practice? A: Cassillas just had some kind of injection where they have to hold him. McClain did something to his back the other day and it is not going to be anything major. They held him out today. 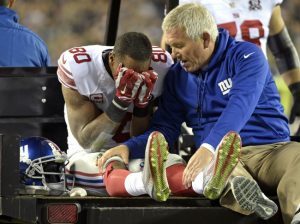 October 6, 2014 New York Giants Injury Report: RB Rashad Jennings sprained the medial collateral ligament (MCL) in his left knee in the game against the Atlanta Falcons on Sunday. Jennings will not need surgery but he was wearing a knee brace when talking to the press on Monday. It is not clear how much time he will miss. Meanwhile, CB Dominique Rodgers-Cromartie underwent a medical exam on Monday to check out a hip/leg issue. LB Jon Beason (foot/toe) was held out of his third consecutive game on Sunday. “The injury obviously and the projection between the medical people and Jon himself as to how far he could go into the game and where he would be if he were to put another solid week in front of him without any kind of setbacks,” said Coughlin. RB Michael Cox and CB Jayron Hosley Added to 53-Man Roster: The New York Giants signed RB Michael Cox to the 53-man roster from the Practice Squad on Monday. CB Jayron Hosley was also officially added to the roster after his 1-game roster exemption expired following his 4-game NFL suspension for violating the league’s policy on illegal drugs. 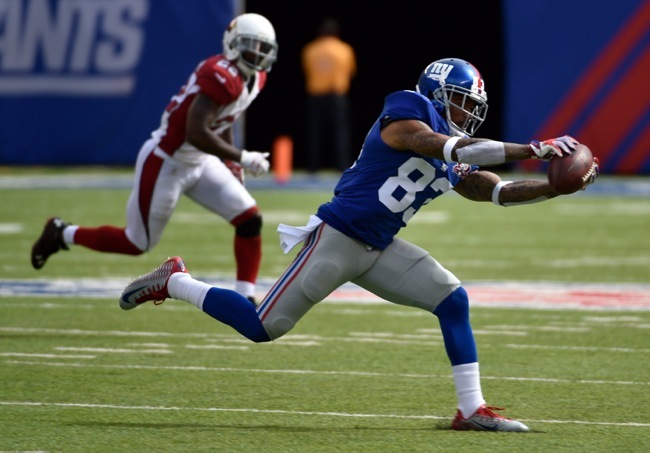 To make room for Cox and Hosley, the Giants waived WR Julian Talley and CB Chandler Fenner. 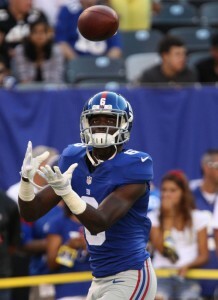 The Giants also waived WR/returner Trindon Holliday (hamstring) off of Injured Reserve with an injury settlement. October 6, 2014 Tom Coughlin Press Conference: The transcript and video from Monday’s press conference with Head Coach Tom Coughlin are available at Giants.com. Sights and Sounds from Giants-Falcons Game: A sights and sounds video from the Giants-Falcons game is available at Giants.com.